Recorded: Siam Pattana Studio Bangkok,Thailand 1990. Recorded: All Saints, Harewood, England June 13, 1991. Recorded: St Judes on the Hill, England July 2 & 3, 1991. Recorded: Trium Udom High School April 24, 1992 & Chulalongkom University Bangkok ,Thailand April 15, 1992. The Founders of FONG NAAM are Boonyong Ketkhong and Bruce Gaston. 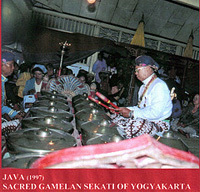 Boonyong Ketkhong is considered one of the greatest masters of renat ek or soprano xylophone. Bruce Gaston, at the time of these recordings, had been studying Thai music with Boonyong Ketkhong for more than 20 years, teaching at Chulalongkom University and specializing on the khong wong yai or large gong circle. 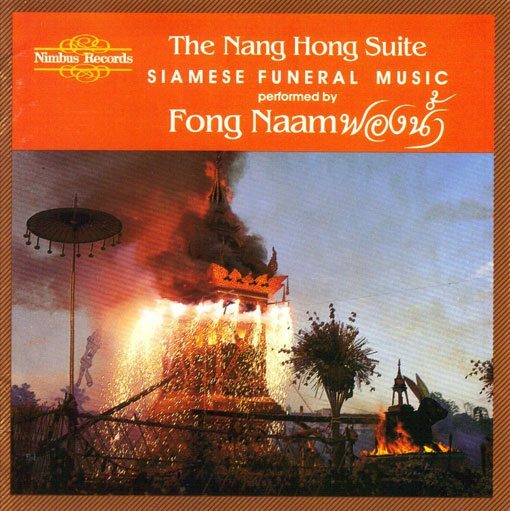 Various Thai musicians take part on each of these recordings. Notes on the Recordings: Montri Tramoj, Prasarn Wongwirojruk, and Bruce Gaston. Some years ago, in the course of formulating ideas about how players might optimally approach free improvisation, I came across several outstanding recordings of Thai classical music. The thinking behind this remarkable music seemed to mesh with and help solidify the directions in which my own musical thinking was going. As I pointed out in the brief discussion on improvisational form that appears in the Anthony Braxton Echo Echo Music House review (see http://henrykuntz.free-jazz.net/category/echo-echo-mirror-house-music-implications-for-improvisation/), the ways in which players relate to each other improvisationally has everything to do with cultural imprinting. Even when players have vastly expanded concepts of pitch, timbre, harmony, and rhythm, the ways in which they formally relate remains largely culturally determined. Deeply ingrained concepts of how disparate sounds and musical lines should work together, of the nature of musical “development”, of dynamic and dramatic structure and, moreover, of how music itself ought to be perceived and given weight to retroactively and artistically are notions that are almost never questioned. Generally, the only questions are whether or not one believes some ideal or standard of those concepts has been attained or achieved. It is instructive then to go inside another culture’s imprint in order to gain a perspective on our own and to view some other ways that music might work. Certain Thai music, of the sort that I came across, provides a quite different world view. 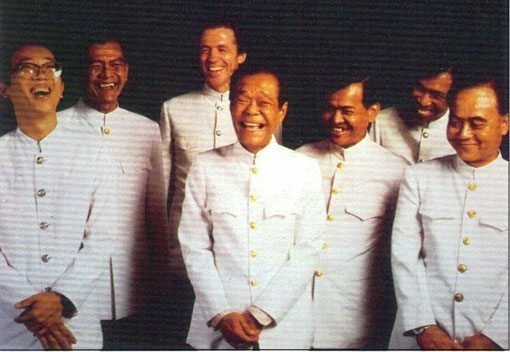 I’m speaking mainly of the music of the Thai piphat ensemble, Thailand’s oldest and most archetypical musical grouping. 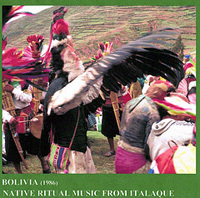 Although I purchased superb cassettes of this music when I first visited Thailand in 1990, it was only later, when I encountered an exceptional series of CDs by the group FONG NAAM, with extensive and incisive notes on the music, that I began to truly “understand” the Thai musical approach. The Thai piphat ensemble is made up of a blown double-reed instrument, the pi, representing the pi in pi-phat, and percussion instruments, representing the phat. 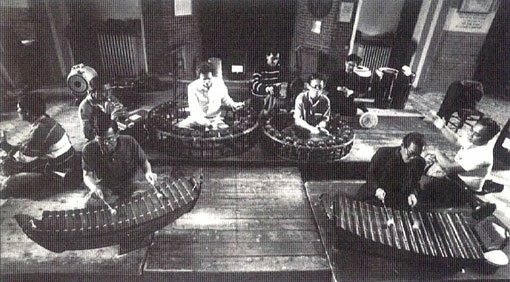 In the original piphat orchestra, the percussion instruments were a tuned gong circle (khong wong yai), a large mounted two-sided hand played drum (tapone), a two-sided timpani (glang tat), and small finger cymbals (ching). The soprano xylophone (renat ek), the modern ensemble’s most prominent and signature instrument, was added later, being adopted from folk orchestras. With its delicately balanced mix of individual and group expression, the music of the piphat ensemble is unlike any western music. While the musical approach of the pi, with its rhythmic and harmonic freedom, might easily pass for a type of free jazz, there is – despite textural variances – virtually no dynamic or dramatic declamation in the music as a whole. Rather the music is built upon and attains its identifiable sound from the extensive individual freedom that exists within the group context. That may sound like some high ideal of free jazz or free improvisation, but in Thai music the component parts relate and inter-relate completely differently, working from and embodying a quite different cultural imprint. Of course, in some piphat music, there is an opening thematic statement or a thematic introduction by a solo vocalist but, following from that, the ensemble members re-present the theme in a “characteristic instrumental version” in the manner described above. There is also an advanced – and astounding – Double Piphat ensemble, but while the orchestra itself is extended, there is no actual doubling of instruments. Rather, there are higher and lower pitched double reeds, soprano and alto xylophones, large and small gong circles, and two different types of small cymbals; and the ideal of musical expression is the same. 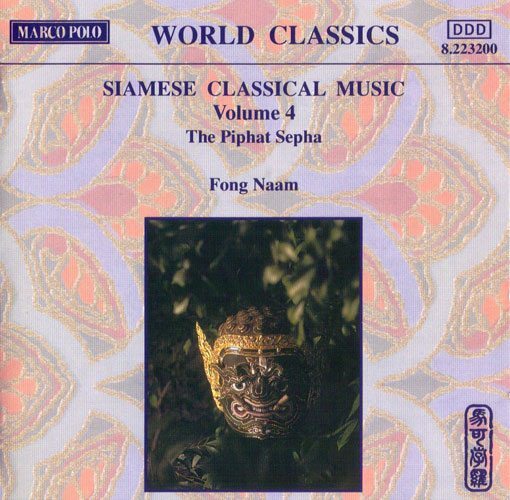 There are also numerous esoteric and subtle aspects to this music as well as historical and modern variations of Thai oral compositional form – all of which are referenced in the notes to the FONG NAAM CDs. But it is the Thai egalitarian ideal of individual and group interplay – the concept of concurrently evolving musical ideas with clarity of instrumental line – that interests me most about this music. It is an ideal that has influenced my own music and one that I believe can have application to a wide range of thematic and non-thematic based forms of musical improvisation. 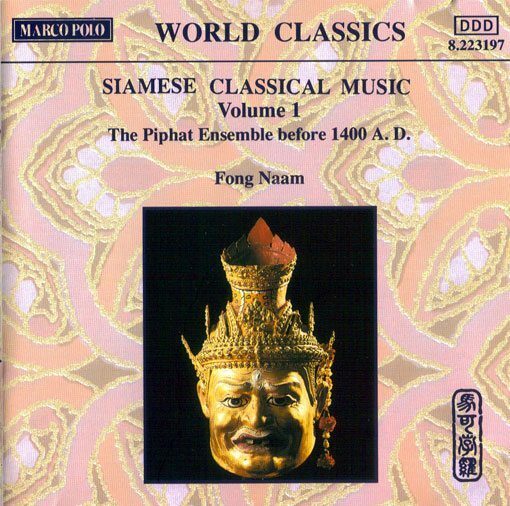 Siamese Music Volume 1: The Piphat Ensemble before 1400 A.D. presents music with the original 5-instrument piphat grouping. Two of the CD’s four pieces are played by a “small instrument” ensemble used for accompanying the Thai shadow play. Another piece features an older composition with inclusion of the newer renat ek or soprano xylophone. The remaining piece, # 2 on the CD, is closer to “pure” Thai music; on this piece the full sound of the early 5-instrument ensemble can perhaps heard to greatest advantage. All of the music is fascinating. 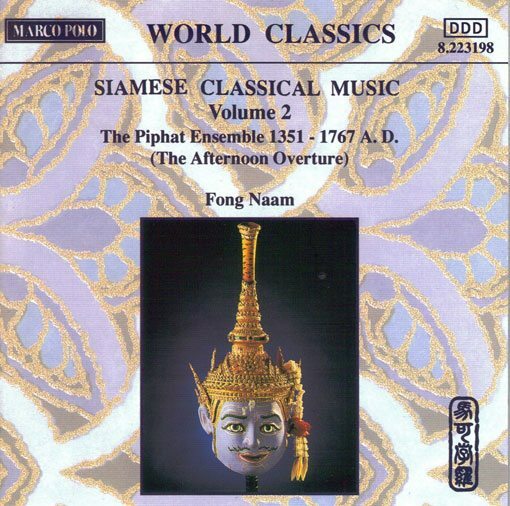 Siamese Music Volume 2: The Piphat Ensemble 1351 – 1767 A.D. (The Afternoon Overture) offers a clear and elegant presentation of ten connected pieces played by the full piphat ensemble (i.e. with renat ek). The opening three pieces are longer in length than the subsequent ones, allowing for more extended musical development. The Sleeping Angel presents two sections of music played by the Double Piphat ensemble as well as pieces for solo instruments and the music of another type of Thai orchestra. Siamese Music Volume 4: The Piphat Sepha presents music that is prefaced by the presentation of a theme by a solo vocalist. The Double Piphat ensemble is featured in an splendid opening “overture” (without vocalist) and in a long closing piece that is based on an “advanced” compositional form requiring players to maintain the integrity of certain structural notes in their instrumental renderings. If one were to approach the free jazz of the Sixties in philosophical terms, one might perceive a dialectical current running through it between new ways of Being on the one hand and the seeking of Spiritual Transcendence on the other. Ornette Coleman’s music might be seen as representing one evolving thread of that dialectic and John Coltrane’s music the other, with the philosophical tension between the two threads informing the music of numbers of other musicians. 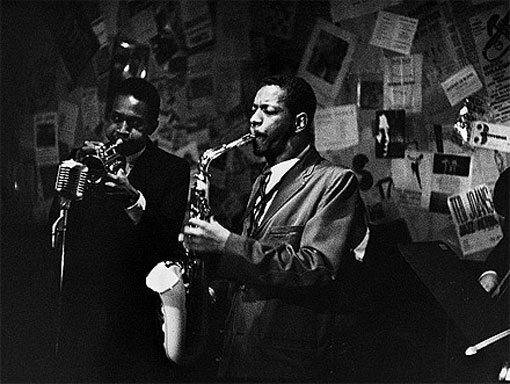 While the two threads were not – and are not – necessarily mutually exclusive – and both were highly revolutionary in the context of jazz, whose main function had always been considered as for “entertainment” – it was the brilliant light from the searing sound of Coltrane’s music that illuminated and overshadowed nearly everything else. The new spiritual awareness his music brought to the forefront, the idea of music as a means of spiritual attainment and even enlightenment, re-set the philosophical path for any number of players. Yet once spiritual awareness or transcendence has been attained, one must still live in this world on this planet in this universe. And so most post-Coltrane music – since at least the late 1960s with the emergence of the AACM, and continuing through to the present – might philosophically be viewed as being characterized by broad explorations of new ways of Being – i.e. how can we all actually BE together on this planet – and the bringing together of seemingly opposite stylistic, cultural and creative musical approaches. Anthony Braxton’s Echo Echo Mirror House Music can be seen as one advanced working model of this kind of philosophical thrust. Within the most advanced free improvised music (say, that of Parker-Guy-Lytton, to choose one example), the evolution of inner formal complexities might philosophically be seen as a reflection and musical negotiation of the wide and complex web of personal, social, and world relations each of us is an ongoing party to. And across the musical spectrum, we can find any number of more or less finely tuned philosophical models – cultural fusions, electronic extensions and mixes, open compositional forms – whose intent is to integrate the seeming opposites in our lives into workable wholes. There is also a musical form whose philosophical basis might be referred to as that of Pure Being. Onkyo is an original Japanese form based in pure sound that has sought to move beyond personal musical emotions and agendas. One might think of it as a near Zen-like approach to music, a movement toward acceptance without conditions of all Reality. One might also think of it as a minimalist disengagement from real time musical pursuits. But, as onkyo pioneer Toshimaru Nakamura tells us, for him the idea of onkyo grew out an attempt to rebalance his relationship with his instrument (originally, the guitar), allowing the instrument to speak more for itself. So, at its core, onkyo may suggest to us not only a return to a more “primordial” sound sense but a re-thinking from the ground up – i.e. 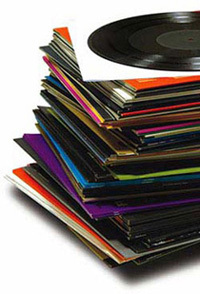 without the weight of historical encumbrance – of what is or can be “instrumental” and “musical” sound and form. Gino Robair/ Drums with Ebow. 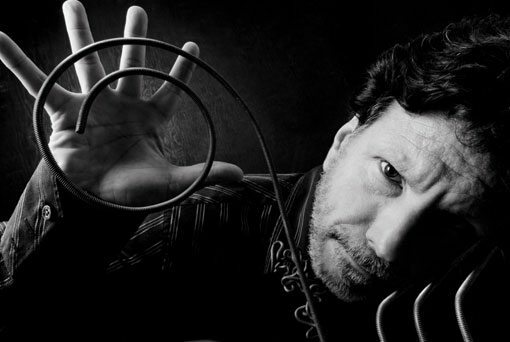 Gino Robair, best known for his de-construction and re-construction of percussion’s component parts (not to mention his outstanding moving-parts opera, I.Norton), takes on this recording a more purely onkyo approach to performance. He subtracts from his music the “activated surfaces” he brings into play as part and parcel of his hands-on percussion work and makes them the central sound source. While we’ve become accustomed to most onkyo sounds as being so quiet as to be scarcely audible, the up-front sounds we hear on this recording are nothing like that. They include post-industrial screeches and scrapes, rattlings, tweaks and twitters, electronic drones, and raw garage-like drum patterns. Perhaps we should call this music punk-yo! There is also such a varied and disparate textural and dynamic sound palette that it is difficult to believe that what we’re hearing was created without human interaction or intervention. But that is exactly the case. Can I say I found the resultant sounds to be engaging? Toshimaru Nakamura would say that’s fine but the emotional engagement is all mine, since the sounds themselves simply exist and have not been given human emotional impetus to, except insofar as a person has presented them. So perhaps I should simply say I found this to be a “stimulating” presentation of these particular pure sounds. Perhaps you may find them stimulating as well. 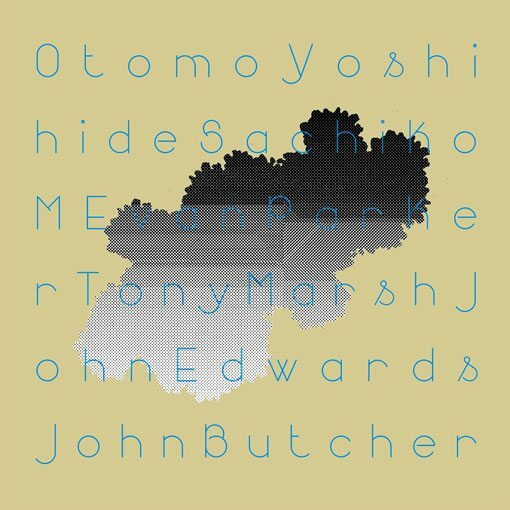 Otomo Yoshihide / Guitar; Sachiko M / Sine Waves; Evan Parker / Saxophones; John Edwards / Double Bass; Tony Marsh / Drums; John Butcher / Saxophones (Sextet only). 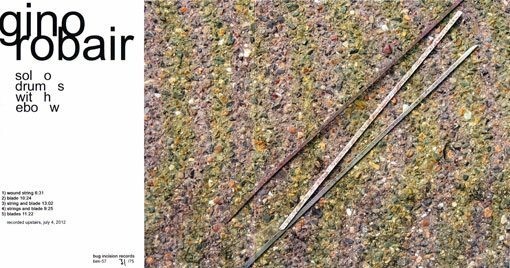 Recorded: March 9, 2009 at Café OTO, London by Shane Browne. Mixed by John Butcher. Mastered by Andreas Lubich. Pressed at Record Industry in The Netherlands.Three color screenprint cover by Paul Abbott. 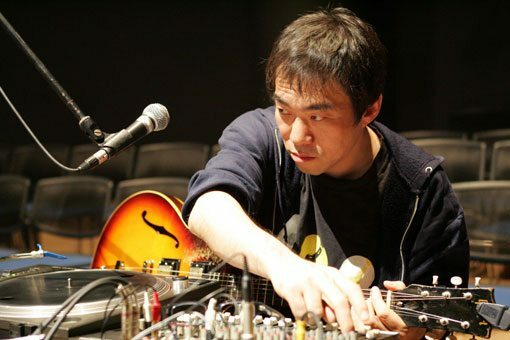 Two pioneers and masters of Japanese onkyo meet a multi-generational mix of British pioneers and masters of free improvisation. 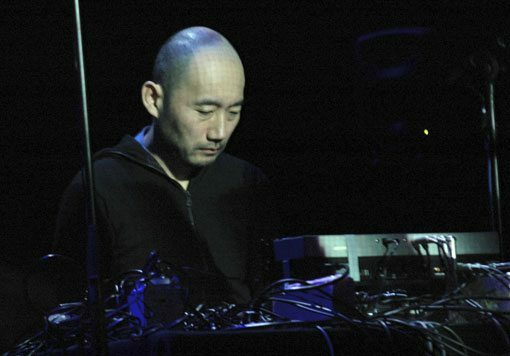 Recorded live at London’s Café OTO at the end of a week-long residency of the Japanese players, the collaborative musical meeting is fresh and inspired. 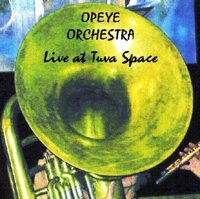 The recording stands as a finely-honed classic of classically approached free improvisation: the players dance and flow smoothly and effortlessly with and around the sounds of their partners. 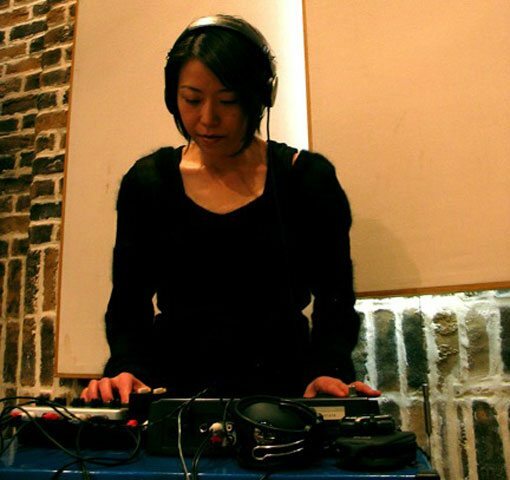 Of the two onkyo players, Sachiko M stays the sonic course with high-pitched broken sine waves emitted from her no-samples sampler – but she chooses carefully when and where to insert them. Similarly, Otomo includes the static-y crackles and pops from his turntable. But he is also right in the forefront of the musical mix with his electric guitar. 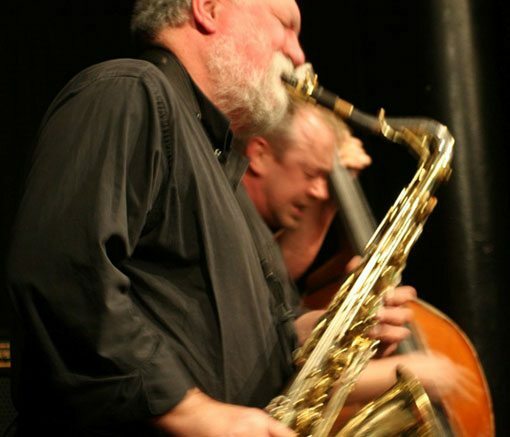 If at moments his playing calls to mind Derek Bailey, Joe Morris, Henry Kaiser or others – not to mention his own work with his New Jazz Quartets and Orchestras – these are but indications of the broad scope of his personal sound world. He works from extremes of electronic inflection, stretching the sound of his guitar in every direction with the infusion of thick sonic clusters, dynamic out-of-phase feints, fuzzy noise, wavy drones, and loosely compacted single note runs. 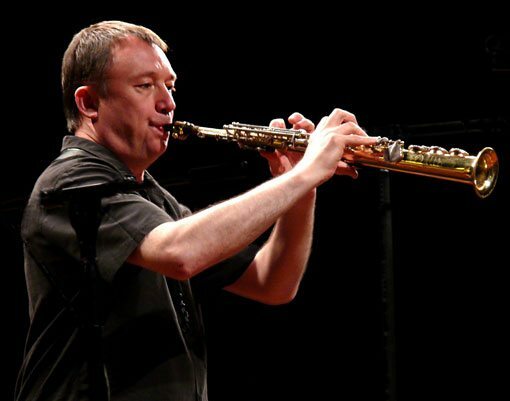 With all that, he establishes a workable link between the onkyo sound world and the singular instrumental approaches of the British improvisers. The British players, for their part, are at the top of their game. Parker leads the way on the Quintet side with a particularly energized and earnest performance from his sophisticated post-jazz tenor. But his playing turns on a dime to meet or match the directional input of any of the other musicians. On the Sextet side, the interaction between him and fellow saxophonist John Butcher is fascinating. To open, the two face off on soprano. Butcher, working from his finely crafted range of pure sounds, gravitates quickly toward the onkyo sonic palette, while Parker – with a nod to the flinty tone of his work with the Music Improvisation Company – weaves microtonally through the mix. Following a subtle switch by both men to tenor, Butcher steps out and up into the post-Blue Note jazz world. Parker takes up the challenge and, for a moment, you might think you are listening to Joe Henderson and Pharoah Sanders from something out of Alice Coltrane’s Ptah the El Daoud. 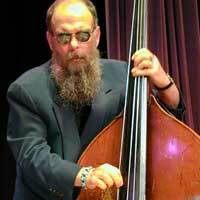 On both sides of the disc, John Edwards’ big stringy bass helps paste all these sounds together; as a soloist, he quickly engages and segues easily into and out of the large group sections. This is the first time I’ve heard drummer Tony Marsh, and I’m impressed with the way he holds and intensifies the musical experience, adding or subtracting textural breadth and depth to the ensemble. 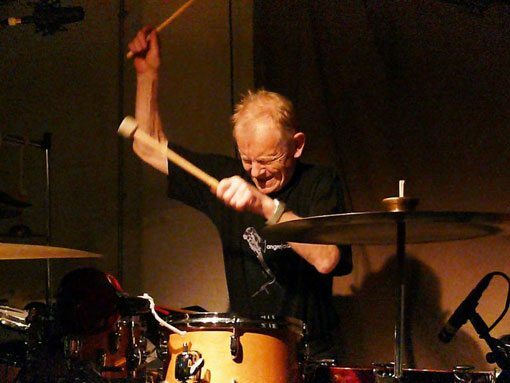 He works from a largely dry palette, tympani-like at times, with contrasting cymbal thrashes. This is mesmerizing highly-distilled organic improvised music. 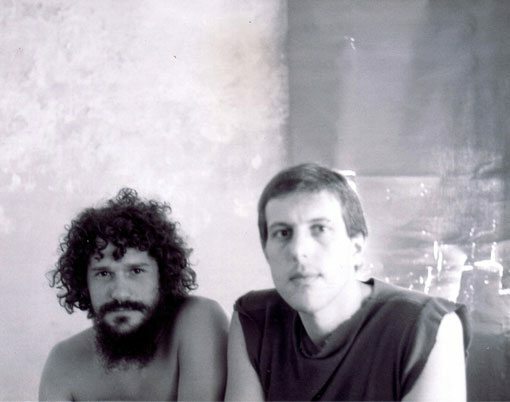 July 4, 1979 and The Greater Vehicle (from December 4, 1979), both recorded at San Francisco’s Metropolitan Art Center, are hot elemental duos with John on alto saxophone and Joe Sabella on drums. While The Greater Vehicle builds exponentially from spirited (and spiritual) post-Coltrane Africanized modalities, July 4, 1979 is like a streaking comet from a place of “no mind”. Modal operatives have been suspended or internalized, the music manifesting at a higher more potent level of abstraction. 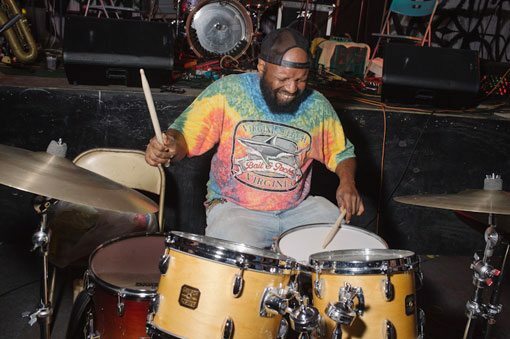 Gruntfest’s saxophone soars through the stratosphere, occasionally spinning off of some self generated propulsive axis; it is engulfed by the bold thunderous multi-tiered rhythms of Sabella’s one-man drumming corps. Free Music Orchestra/ reeds, brass, flutes, drums and percussion played by a wide array of San Francisco Bay Area improvisers. Recorded: April 5, 1980 Metropolitan Art Center San Francisco. Following the success of his 1979 Free Music Orchestra Piece for Forty Horns (see review http://henrykuntz.free-jazz.net/category/john-gruntfest/) John composed a new piece for the 1980 San Francisco Free Music Festival. With a similarly gargantuan ensemble and a wider range of instruments, the 1980 piece was even more ambitious. At 35 minutes, it was three times as long as the first orchestra piece; there were several thematic propulsion points to fuel its ebullient free-form density; and there was a succession of soloists to provide contrast to the mass sound. The soloists, for their part, had to transitionally hold the emotional weight of the entire ensemble. Most risky of all, at the center of the piece, connecting avant-future with the hopes of the past, was an emotive folk song lament for what was once the promise and grandeur of the land of California. How does the music sound? The drums and percussion are a cauldron of wild energy while the ensemble sections are texturally molten and blazing; the solos are highly individual language-expansive statements. While the central folk song seems at first musically incongruous to the rest of the piece, it in fact grounds the music and tethers it to its place of origin – California. As attested to by the wildly enthusiastic audience one hears on the recording, the piece was a rousing success. What strikes me now about this piece – 34 years removed from its performance – is the underlying depth of passion we all had as players (I was also an orchestra participant) and our underlying belief in the revolutionary thrust of the music we were playing – that, like the trumpets that brought down the walls of Jericho, this music – our music – could make a spiritual, cultural, and political impact and difference. While it may seem difficult, perhaps even naïve, to hold on to such a belief at this point in time, this music – given impetus to by John Gruntfest – is a reminder that no matter how skewered reality may be or seem, there can be no real way forward without a Sense of the Oneness of All. And that is what stands at the core of this music. Marc Edwards/ drums, Gene Janas/ bass, Ernest Anderson III/ guitar, Takuma Kanaiwa/ guitar, Tor Snyder/ guitar, Lawry Zilmrah/ bicycle wheel electronics. Recorded: March 28, 2011 live at Funkadelic Studios. Marc Edwards/ drums, Ernest Anderson III/ guitar, Takuma Kanaiwa/ guitar, Alex Lozupone/ 7-string guitar, split-signal bass accompaniment. While not trying to make too much of labels, this attractive music is what one might refer to as avant-contemporary music rather than, strictly speaking, avant garde. That means that the music holds a firm sense of its roots while at the same time taking off into the future. As if drawing on the views from a docking station, each disc presents something like its own interstellar space suite. Dark Space on Planet H Just Blew Up blends a modal approach to improvisation with slow-building waves of bending psychedelic guitar. The tamboura-like opening evokes Alice Coltrane. Planet H Just Blew Up is more in the mode of the music by Sonos Gravis, with Edwards’ drums exploding into an expansive poly- rhythmic centrifugal force: the guitars circle round the all-encompassing rhythmic center, playing over, under, around and through the colossal thrust. On Suspended Animation, with its swinging Latin jazz-rock feel, Edwards propels the piece with a light and loose forward momentum. 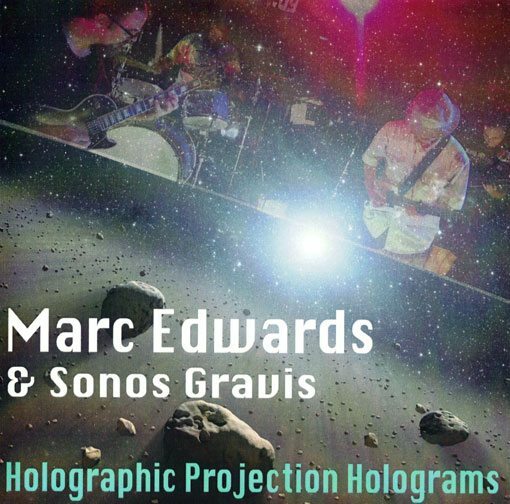 The quartet disc Holographic Projection Holograms by Sonos Gravis is something else: a next-level guide to the universe for advancing space travelers. Birth of the Universe features dense, out-of-phase melodic lines and rhythmic clusters by the guitars that coalesce – or not – in and out of pulsing spatial/temporal dimensions. Floating in Space is weightless: the sense of being out of gravity yet surrounded by dark gravitational pulls and cosmic explosions. Star Flakes opens as a “space march” then implodes on itself and goes into a churning cosmic free-fall through unknown super-active galaxies. 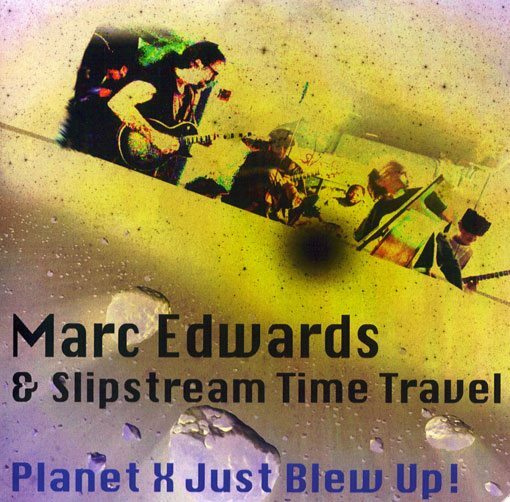 I love the spirited vibrancy of Marc Edwards’ new music of the spheres – both with Slipstream Time Travel and with Sonos Gravis – and the exhilarating feeling of being in some boundless out-of-ordinary-time reality. 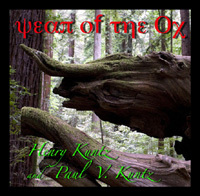 Please provide your email address to subscribe for updates on Sax & Stories by Henry Kuntz. Thanks! Journey to Italaque Part III. Journey to Italaque Part IV.